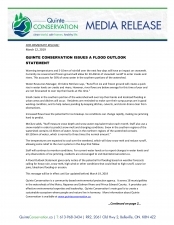 ATTENTION RESIDENTS: Quinte Conservation has issued a Flood Outlook Statement (please see below). Due to ice build up and recent rainfall most roadside culverts are frozen. Public Works staff have been thawing culverts and clearing snow from ditches in noted problem areas. The Municipality of Tweed has 600 kms of roads to maintain and the Public Works Department are doing their best with the resources available to reach noted problem areas. With mild temperatures forecasted over the next few days localized flooding may occur on municipal roads. Please use caution when driving in hazardous road conditions. If needed, sand bags and sand are available to residents at the Stoco Public Works Yard (869 Marlbank Road); Actinolite Works Yard (39 Bridgewater Road) and behind the Tweed Public Library.